The RiverSmart Homes program is a unique partnership between Casey Trees and the District Department of the Environment (DDOE) that helps homeowners add shade trees to their residential property for just $50.00 per tree. As the RiverSmart Homes Arborist Auditor, I visit the homes of all the individuals who have requested trees. To get there, I ride my bike. I have found that biking allows me to see a greater number of interesting things and see how neighborhoods compare in their tree planting efforts. I have been particularly impressed by what is going on in the Shaw-Howard neighborhood. Good trees such as sweetgum, serviceberry, southern magnolia, redbud and sweetbay magnolia are taking root in people’s front yards at an impressive rate. 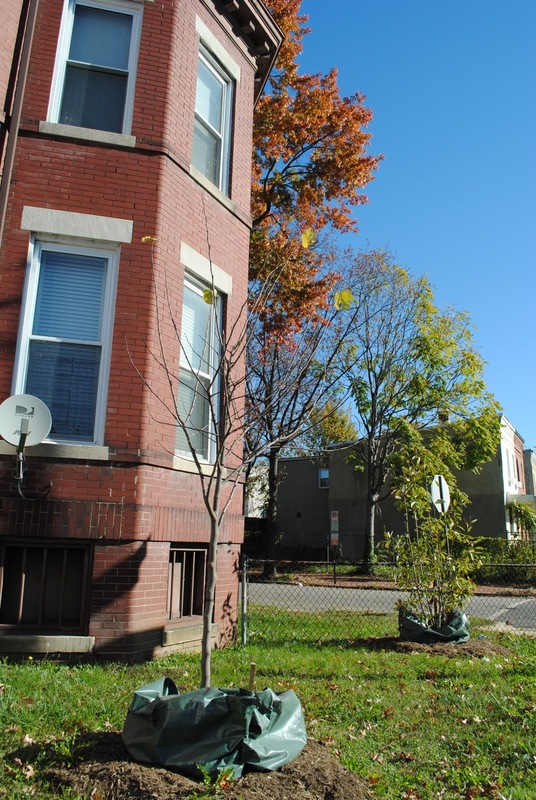 This fall, through the Riversmart Homes Program, Casey Trees planted at three houses along S Street NW and at one house on 6th Street NW. 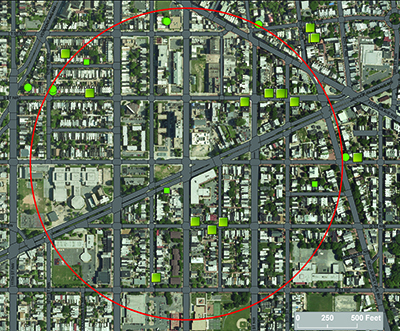 Three other residents within the quarter-mile radius, shown in the map, are signed up for a spring (March-May) planting. Other residents have planted trees through our Tree Rebate, Community Tree Planting and Treescape Design Workshops. 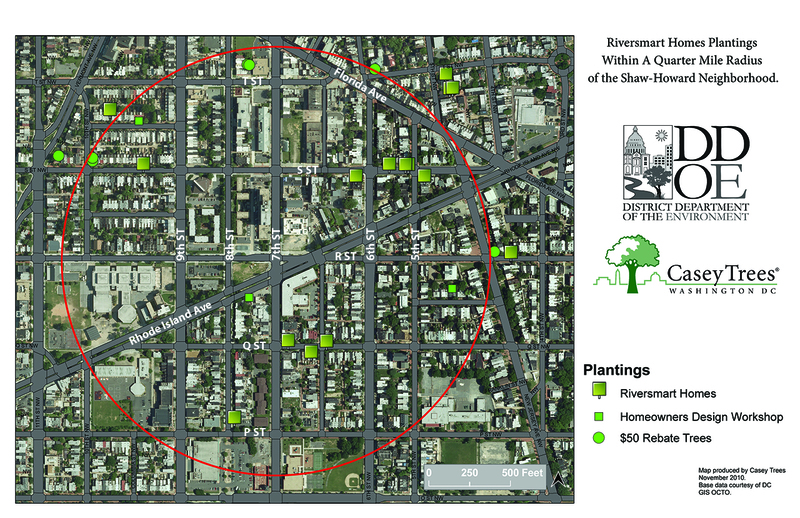 View a full-size version of the map of the trees planted in the Shaw-Howard area by Casey Trees through our RiverSmart Homes program and other efforts. Typically I meet with homeowners who all have one thing in common - they want a tree. Their reasoning for wanting the tree makes them unique. Common reasons include wanting to reduce storm water runoff, cool their house, add privacy, hide an undesirable view and infuse seasonal color. I consult with them on where they should consider adding trees and help them select tree species that will help them best achieve their goals. 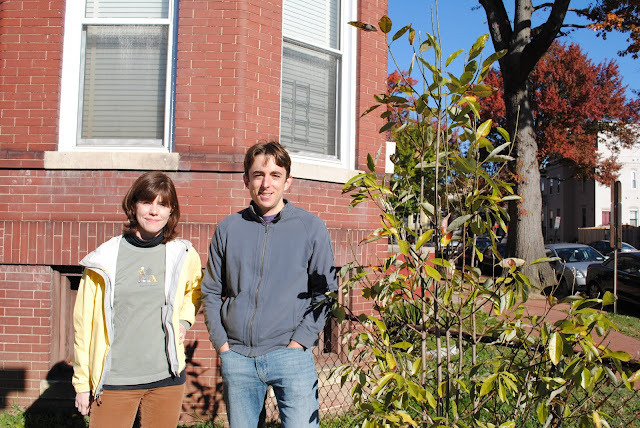 Sara Turner and Berin Skoza stand by a newly planted tree. Back in September, I had an appointment with Berin Skoza, an active and engaged citizen of the neighborhood. He wanted to green his neighborhood with trees. Berin took me around and introduced me to several of his neighbors. I met Heidi and her toddler. I consulted with Joe, a carpenter and designer. I worked with Gretchen who has lived in the neighborhood for over 25 years. I consulted with David and Ann. I met May, a lovely senior on S Street, who wanted a tree because her neighbor has one. She also saw our crew planting trees one day, and asked crewman Jabbari Brew, how she could get her hands on one. Our Executive Director, Mark Buscaino, always reminds staff how important trees are for greening streets and cooling the District but also for bringing people together. My BFA thesis show of oil paintings and prints explored the theme of the sociological coming together of people through food and eating at the table and playing card games. It is very thrilling that even through a different medium – soil and woody plants – my work still focuses on the notion of people coming together. This time through trees! Shaw residents have spread the good word, from neighbor to neighbor, about trees and about the work Casey Trees and the DDOE is doing. Thanks, Shaw Neighborhood, for letting me be a part of your community building. For more information on our RiverSmart Homes program, visit our website or contact Sara directly at sturner@caseytrees.org.